Funeral Flowers from THE PAISLEY POSEY - FLORAL & GIFT SHOP - your local West Liberty, KY.
Let THE PAISLEY POSEY - FLORAL & GIFT SHOP deliver a lovely floral expression of sympathy and reverence for you. This arrangement features white roses, Fuji mums, gladiolus, lilies and bells of Ireland. A funeral for a friend or loved one can be difficult, but funeral flowers from THE PAISLEY POSEY - FLORAL & GIFT SHOP of West Liberty, KY can help begin the healing process. Funeral flowers provide the opportunity to express how much the departed means to you. Celebrate the life of your loved one with one of the beautiful funeral flower arrangements found here such as: Classic Remembrance Urn, Mixed Flowers Sympathy Tribute or one of our standing sprays. Browse our funeral flowers page to find the perfect sympathy arrangement and place your order online. 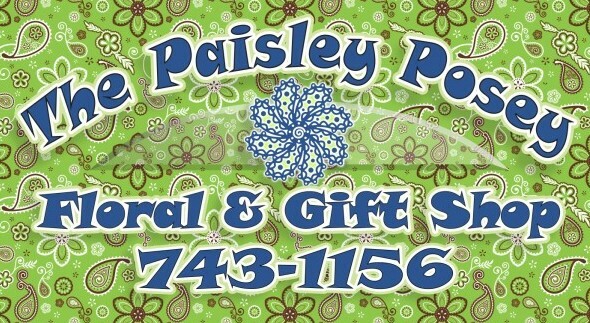 You can also call and speak with a designer at THE PAISLEY POSEY - FLORAL & GIFT SHOP in West Liberty, KY for funeral flowers just as unique as your friend or loved one.